Crisis City is the seventh level in Sonic Generations, and an adaptation of the level Crisis City seen in Sonic the Hedgehog (2006). Bringing back painful memories of a distant future, Crisis City returns in full force with more emphasis on the lava areas, with lava spouts, various magma pools, and even the dreaded fire tornado returning in both acts. 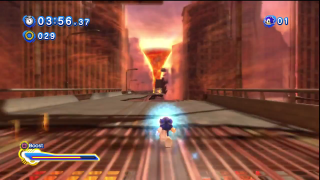 Modern Sonic runs along the destroyed highways in the city much like his previous outing, using the Stomp ability to push down lava geysers. At the end of his act the Fire Tornado throws various objects for him to dodge. 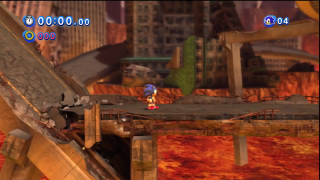 Classic Sonic takes a different approach to the level and platforms through destroyed and mangled buildings. He also contends with the Fire Tornado at the end, but he must jump on floating objects the twister has picked up in an effort to reach the moving goal post being swept away. After defeating Perfect Chaos, Classic Tails tells the Sonics they are doing a great job bringing back the worlds in the white void. The Time Eater comes back again, and brings three new levels, including Crisis City. It also tries to grab a Chaos Emerald it finds upon revealing the new worlds, but finds it cannot retrieve it. Classic and Modern Tails both tell them they should also retrieve the Chaos Emeralds as well. Upon beating the level, they free Blaze the Cat. Iblis Biter — Fire-beasts who spew fire at you. Iblis Taker — Phoenix-esque birds who try to swoop in your direction. They can also be used for stepping stones to higher areas. Iblis Worm — A fiery worm that bursts from the ground to throw fireballs your way.